The Tzipi Livni who spoke before a small, private dinner on Wednesday evening in New York seemed more excitable, passionate and downright worried than she has been in these sort of settings. Barely had the guests invited by the S. Daniel Abraham Center for Middle East Peace taken their seats when the leader of Israel’s Kadima party launched right in, with a spirited critique of the Israeli government and a plea to relaunch negotiations with the Palestinians as soon as possible. “The price of not making decisions is higher than the price of making decisions,” she argued, with a notable sense of urgency. In her many references to her own experiences in the negotiating room, Livni was clearly agitated that the progress she had made and the trust that she gained was lost when her arch rival, Benjamin Netanyahu, was given the opportunity to form a government even though his party had won one less seat in the 2009 election. Once in office, Netanyahu effectively canceled those talks (though there’s some dispute about whether the Palestinians also deserve blame for the resulting stalemate). This story "Dinner With Livni" was written by Jane Eisner. Like every good politician, I suppose, she stuck to her script, no matter the question posed to her. She insisted that a two-state solution was not a gift to the Palestinians or to the American president, but the only way to ensure that Israel remains a democracy. “Each state gives an answer to the national aspirations of each people,” was her mantra. When a guest far to her right politically asked why she didn’t make demands on the Palestinians in public, Livni’s voice became higher and more insistent. “I criticize the Israelis because I’m an Israeli,” she said. “I’m not going to vote for Abu Mazen. We need to make a decision on our own vision of the State of Israel.” Besides, she said, such public pronouncements “are not the way to achieve peace. It sounds great, but you need to be tough in the negotiating room,” not before the microphones. 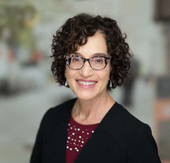 Jane Eisner, a pioneer in journalism, is writer-at-large at the Forward and the 2019 Koeppel Fellow in Journalism at Wesleyan University. For more than a decade, she was editor-in-chief of the Forward, the first woman to hold the position at the influential Jewish national news organization. Under her leadership, the Forward’s digital readership grew significantly, and won numerous regional and national awards for its original journalism, in print and online.